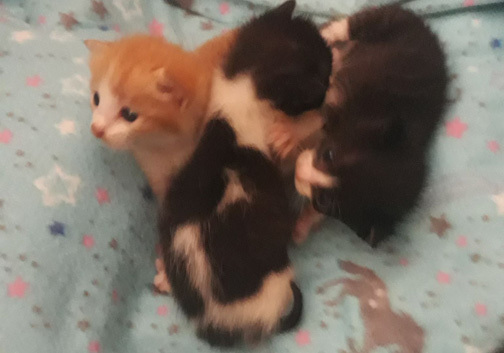 An increasing number of kittens, some have just been born or are just days old, are being found in trash bins or abandoned on a vacant lot or beside a busy street by rescuers or by passersby who report to animal welfare groups. The mother cat is either dead beside the babies or is nowhere to be found. Before getting the kittens, please wait as the mother might just be looking for food and will go back to her babies. The mother is always nearby. She will not go very far. A welcome development in the animal welfare world is the increasing number of humans who are now taking in these kittens, fostering them until an adopter is found. These kittens abandoned on the side of the busy Commonwealth avenue in Quezon City. They were rescued by admin Nicole Benedito of Save Animals of Love and Light (Save ALL). More humans are now willing to help kittens who have been thrown away or whose mothers were hit by vehicles or killed by a cruel person. But not all who find orphaned kittens on the streets know what to do. Kittens with no mothers are at high risk of dying within a few hours or days without the mother’s milk that strengthens their immune system and keeps them from being infected with a communicable disease. To help the loving humans who take in or rescue orphaned kittens, here are some tips on how to hopefully keep the kittens alive from Ellie Williams in How to Take Care of a Newborn Kitten Without a Mother (cuteness.com). “If you've rescued a kitten whose mother died or abandoned her, you'll have to fill that role. Newborn kittens need round-the-clock care and monitoring, but can be raised by a human caregiver. Before attempting this, however, take the kitten to a veterinarian for a thorough examination and to enlist his advice to create a plan of care,” Williams said. The mother cat provides the warmth the kittens need. “Newborn kittens cuddle up with their mother and siblings to stay warm. If your kitten has been abandoned, you'll need to keep her warm. Wrap a heating pad or hot water bottle in a blanket to create a warm bed, but position it so that your kitten can move away from it if she gets too warm. Keep an eye on the heating pad to ensure that it's working properly and that it doesn't get too hot or malfunction,” Williams said. 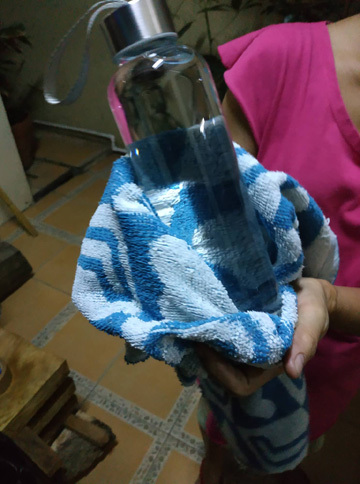 A bottle with warm water is used to keep the kittens warm. Please make sure to wrap the bottle in a towel and keep at a safe distance from the kittens. You can also use a lamp and place over the kittens’ bed. Do not put directly on the kittens. Please monitor the kittens and the lamp as it might get too hot inside the cage or box. “Before hand-raising a kitten, contact local veterinarians, animal shelters and rescue groups. They might be able to find a foster mother cat to feed the kitten, “ Williams suggested. “If you can't find a foster, buy a milk replacer designed specifically for kittens. Don't give a kitten cow's milk, which can cause gastrointestinal upset,” Williams stressed. At three to four weeks of age, you can start giving the formula in a bowl which is easy to drink from. 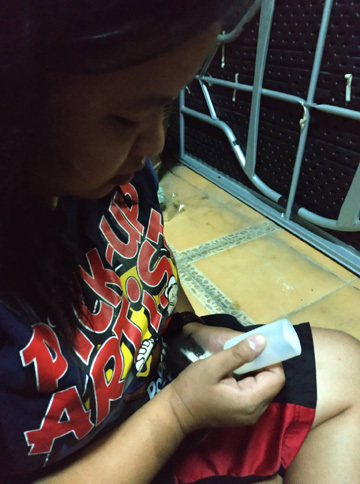 Rescuer Nicole feeding a kitten using a bottle. Keep the head up so that the kitten will not choke. “Then start the shift to an adult diet by mixing canned or dry cat food with warmed formula. When your kitten is around 6 or 7 weeks of age, you can switch her to a dry diet, “ said Williams. At four weeks old, you can begin to train the kitten to use a litter box by placing her in it every after feeding. “Use a shallow box with low sides or use a cardboard box and cut one side low,” Williams said. Please ask the vet when the kittens are ready for deworming and vaccination. Most orphaned kittens do not grow up as normally as kittens with mothers. The vet will also determine the appropriate dosage (dewormer) for the kitten depending on the development and the weight. Vaccinations are given when the vet sees the kittens are strong enough for this.